Looking for quality towing mirrors for your Rover? Clearview’s premiere line of replacement towing mirrors offers superior design, style, and feature-rich functions to meet your needs! Clearview Towing Mirrors are full replacement towing mirrors and should be your next upgrade if you’re doing any repeated towing with your LR3, LR4 or Range Rover Sport. These premium mirrors from down under are now available exclusively for the first time in North America from Atlantic British! As integrated replacement towing mirrors, Clearview Mirrors completely replace your stock LR3, LR4 or Range Rover Sport side mirrors using your original equipment mirror cutouts, fittings and wiring on your Rover. These mirrors are designed for enhanced viewability, function and style and are quality-manufactured for exceptional fit and finish and longterm durability. Clearview Towing Mirrors comprise two mirrors: a large flat mirror operated electronically by your Rover’s controls and a smaller, manually-adjustable convex mirror that gives you an enhanced wide-angle view. Towing a boat, trailer, or something extra large? No worries, the mirror has integrated sliding extensions, giving you the wide view you need to see around your large cargo. The base model includes fully-integrated electronic adjustability using your Rover’s mirror controls. Additional integrated turn signal lights upgrade also available (see alternative items). 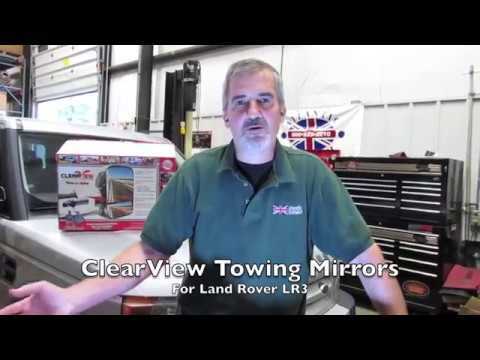 In this video, Doug, our Land Rover Master Technician, will install Clearview Towing Mirrors (part # CV-LR-D34-EB) on our Land Rover LR3.